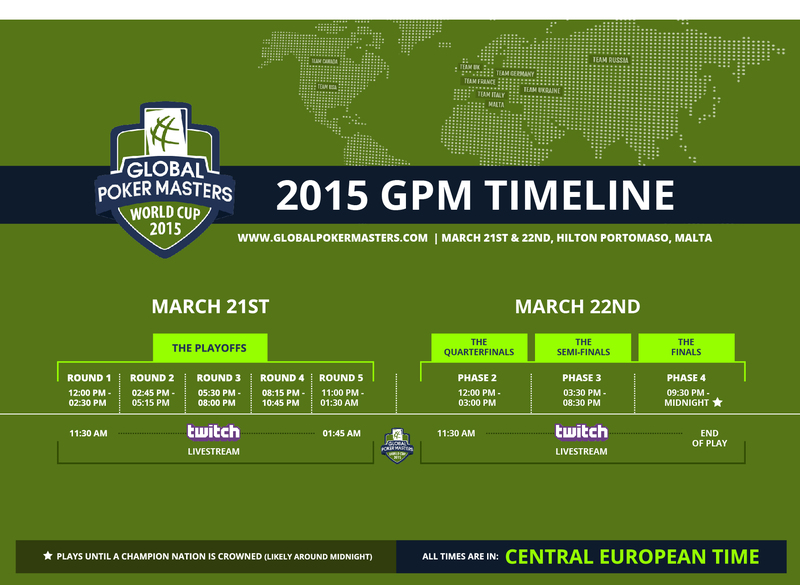 11:30 AM – LiveStreaming of Global Poker Masters begins on Twitch. 11:30 AM – 12:00 PM – Player Introductions & Pre-Show. Playoffs Winner – This team advances directly to The Semifinals & collects the Playoffs Winner’s Bonus. Playoffs Elimination – The Team which comes 8th in points is officially eliminated from the 2015 Global Poker Masters. Quarterfinals Winners – These teams advance to The Semifinals (6-Max Final Table). Quarterfinals Elimination – The Team which comes 8th in points is officially eliminated from the 2015 Global Poker Masters. 3:20 PM – 3:30 PM – Seat draws for the Semifinals. Scenario 1: Action is Heads-Up w/ 2 players left. Scenario 2: The 4 hour time limit for the Semifinals is reached. 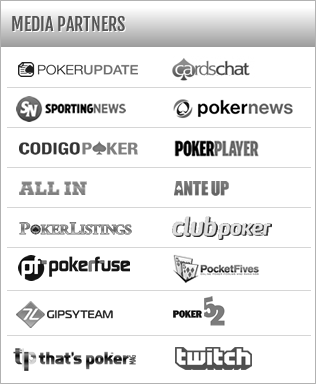 In this case the top 2 stacks will continue on to the Global Poker Masters Finals – with all other Teams Eliminated. 7:30 PM – 7:45 PM – Seat draws for the Semifinals. 7:45 PM – End of Event – The Finals begin and run until one of the 2 remaining Teams’ players have won 3 out of 5 concurrent Heads-Up matches – this team is crowned Champion of the 2015 Global Poker Masters.